Some thoughts about Star Wars: The Force Awakens. This post contains POTENTIAL SPOILERS, so stay away if you haven’t yet been re-bapitized . . . or re-initiated . . . or re-Forcenized . . . or (nevermind). 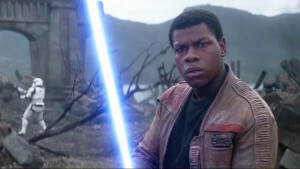 In the context of the “Star Wars” franchise, full dramatic agency (the ability to influence, change, control and survive the dramatic circumstances within the story) is defined ultimately by a “selected” character’s ability to wield “the force” by intuition or training – the decision to not give Finn this final defining characteristic forces (no pun intended) this character into a supporting role for the Whites who are wielding this power. But when we add the fact that Finn is rendered unconscious for the final act of the film (not even able to applaud the efforts of his White cohorts) it can be said that we were not really following the heroic exploits of the Finn character so much as we were being led “by the nose” as it were, to a point where dramatic agency is ultimately still the providence of the White characters in the film. Rescued Poe Dameron, who ultimately was responsible for blowing up the Starkiller Base. Gave critical tactical information to the Resistance on how to disable Starkiller Base’s shields. Once Finn was knocked out, it was then time for Rey’s character arc to be resolved, that of moving from her identity as a scavenger to a potential Jedi, from wasting away on Jakku, where she pined after parents who’d abandoned her, to moving forward with her life. That couldn’t have happened if she and Finn were gripping Luke’s lightsaber at the same time. Finn is a great character and great addition to the Star Wars franchise. I think it’s wonderful that the two main characters are respectively black and female. How boring it would have been to watch another movie with a big-chinned, 'roided-out white male as the lead. But let’s not go down a rabbit hole of over-analysis and baseless accusations of things like “hyper-tokenism.” If Finn in the next movie is relegated to serving Rey her tea before returning to his work in the moisture farm fields, then you might be onto something. I think, however, this series will be more sophisticated.